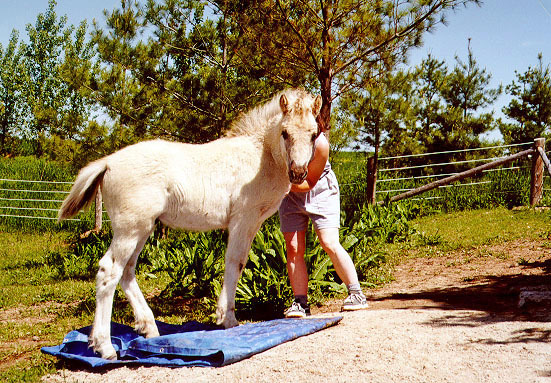 Our Early Training program is comprised of Lori’s own unique blend of classical horse training methods. We habituate the new foal to being restrained and having all parts of the body touched and handled. Over the next few days of the foal’s life, in a series of short frequent sessions, we introduce the halter, lifting the feet, giving to pressure, moving away from pressure, leading and tying. We introduce our young horses to new things in a playful way, which makes them enjoy and look forward to their interactions with people. 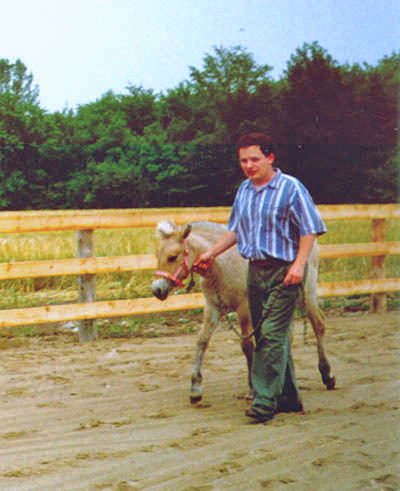 By using short frequent training sessions the foal learns quickly and painlessly during the most trainable time of life, without over-taxing its attention span. We feel that drilling young horses is neither necessary nor effective. Our weanlings are brought into the barn daily and lessons are expanded and built upon. The weanlings are taught to stand back politely when their food is put into their bucket, and yield to the handler’s space. Tying lessons and grooming sessions build on the manners learned at a young age. Our goal is a polite weanling who, above all, respects its handler, and can be handled with a light touch. Riding training starts at between three-and-a-half to four years of age, depending on the development and maturity of the young horse. Our young horses are trained in short daily sessions, following classical dressage principles. 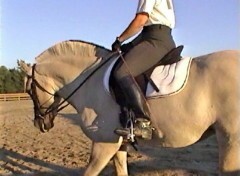 They are started on the lunge line, and become accustomed to wearing tack and going forward into contact. Once they are working quietly on the lunge, usually within a few days, the rider is mounted. 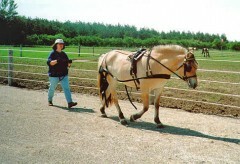 Within the first month or two, our young Fjords are happily carrying a rider at walk, trot, and canter off the lunge. The young horses are taught to go freely forward with our long-term emphasis being on the systematic development of the six principles of the training scale: relaxation, rhythm, contact, impulsion, straightness, and collection. It’s amazing what a difference it makes to the future training when horses are taught from the very beginning to go foward in a good rhythm into the contact. Because we follow the training scale in teaching them from the start exactly what will be expected of them long-term, the horses have a clear understanding and acceptance and the training progresses in a logical manner. We incorporate variety into the daily schooling with cavalletti work, riding out on trails, and working out in the fields and wide open spaces. This helps to teach obedience in a variety of situations and to develop fitness and enhance sure-footedness. The many benefits of cavalletti work to the riding horse are outlined in Lori’s article Use of Cavalletti in the Training Program. 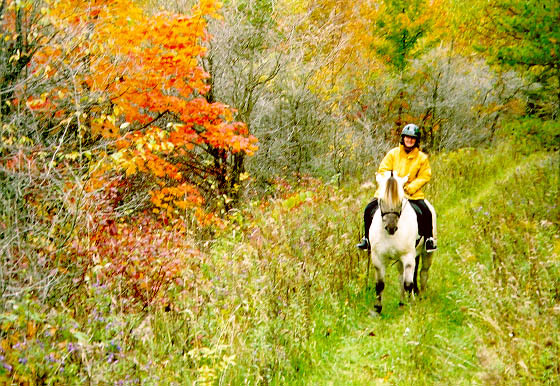 In the early years of Bluebird Lane, our time was evenly divided between riding and pleasure driving with our Fjordhorses. At that time, we started all our young Fjords in harness at age three, and under saddle at age four. Now, since Lori has become more and more interested in (or should we say, obsessed with?) 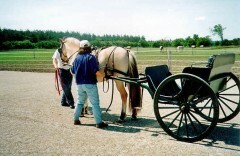 dressage riding, the driving has taken a back seat to the riding. Dressage riding is what we enjoy most and has evolved into our specialty. All of our young horses are started under saddle and brought along with a dressage focus. Driving training we now approach on an as-wanted basis. The driving training starts with an introduction to the harness and becoming accustomed to the feeling of the flapping pieces of leather. Typically this would be done while the horse is eating hay in the stall. 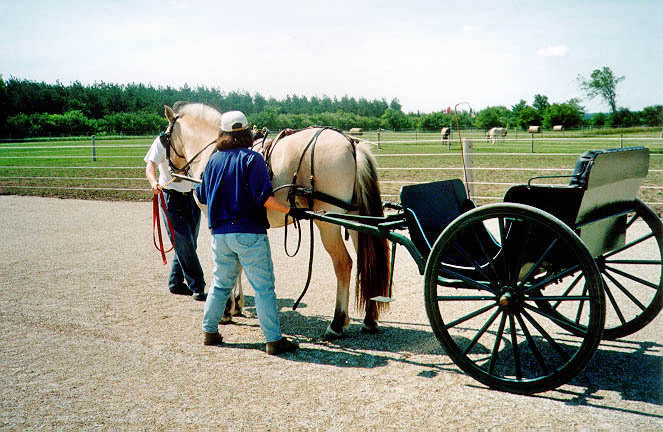 We move on to a careful and thorough ground driving program as outlined in Heike Bean’s Carriage Driving book (see sidebar). We give the horses plenty of time to become accustomed to each step before moving on to the next step. 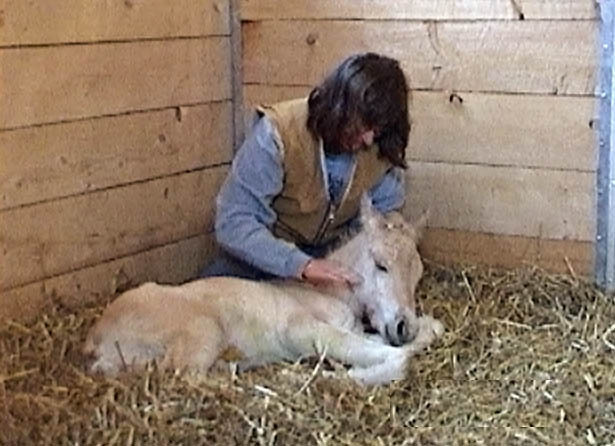 The book The Complete Book of Foaling: An Illustrated Guide for the Foaling Attendant has a very good section on “Being There” for those readers looking for hints on monitoring your mare for foaling signs. For the training of day-to-day manners and ground-work I like trainer Cherry Hill. Her books and methods are logical, systematic and straight-forward, with no mystical whispering powers needed. I recommend The Formative Years – Raising and Training the Young Horse from Birth to Two Years. For driving, Heike Bean and Sarah Blanchard’s book Carriage Driving: A Logical Approach Through Dressage Training is excellent. The ground-training section alone is worth the price and any horse, not just one destined for driving, would benefit from being put through the program outlined.